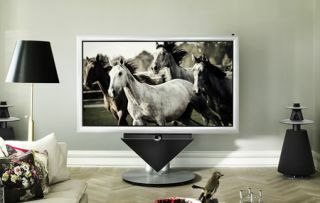 Bang & Olufsen unveils its first Full HD 3D TV | What Hi-Fi? Luxury 85in 3D plasma screen uses active-shutter technology and delivers "3D sound"
We suspect you won't find Bang & Olufsen's first Full HD 3D TV, the 85in BeoVision 4-85, on sale at your local electrical shed. This is one seriously high-end TV, and we suspect it won't be cheap. B&O is remaining coy about the UK price until next month's launch. The plasma panel uses active-shutter 3D technology and has automatic colour management to deliver "exceptional picture quality", we're told. "With 2011 heralded as the year of 3D content and Sky commissioning its first full 3D arts documentary in January, those looking to bring the opera, theatre or sporting crowds into their living rooms need a system that plays on all the senses," says B&O. In addition to 3D pictures, the BeoVision 4-85 delivers "3D sound" using B&O's BeoLab 10 centre speaker system and patented Acoustic Lens technology. When coupled with BeoLab 5s or other B&O speakers, owners can create an intelligent 7.1 surround sound system which adapts the sound depending on the dimensions of the room and your position within it. A motorised stand raises the screen at the touch of a button, and turns and tilts it to provide the optimum viewing angle. An anti-reflective screen coating and advanced picture controls help deliver the best picture quality, whatever the ambient lighting conditions, B&O claims.